Typically when we profile an artist for our ongoing Artist Spotlight series, we choose an artist who is educated in a classical style, a product of some type of formalized art education. The artist we're going to be looking at today was certainly trained in a formalized style, but one that we've never approached before. Sun Mu is a North Korean defector who was originally trained by the oppressive dictatorial regime of the so-called Democratic People's Republic of Korea or DPRK, known to the rest of us as North Korea. Having spent the majority of his career painting large-scale propaganda pieces for the North Korean government, he was lucky enough to escape the country in 1998, leaving behind famine and censorship for a kinder world, but he hasn't forgotten what life was like in the country. He now uses his state-trained skills at propaganda to poke fun at the very leaders he was originally commissioned to glorify. Once he was settled safely in South Korea, Sun Mu attended Hongik University in Seoul, one of the leading art programs in the country, and his style gradually evolved into a pastiche of his old and new lives. Perhaps this is why he uses the pseudonym Sun Mu, which means "no borders". Sun Mu is also the subject of a documentary by Adam Sjoberg titled "I Am Sun Mu", which chronicles the artist's life and his first attempted show at a gallery in China. We say 'attempted show' because the show was eventually shut down by the authorities days before the opening due to fears that it would offend the North Korean government. South Korea, unfortunately, also has something of a tenuous relationship with former North Korean artists, as they generally choose to step rather carefully around the North in general. Why he would have chosen to exhibit in China is something of a mystery, but regardless, his works have successfully reached the rest of the world to general acclaim, including shows in the United States, Norway, and Germany. Koen De Ceuster, a North Korean art expert from Leiden University remarked on Sun Mu's style in the LA Times. "By using the same visual language but … inverting its message, he fundamentally unhinges the propaganda message. Because he knows so well how the propaganda works, he can deploy the same tools to show how sinister its message is." 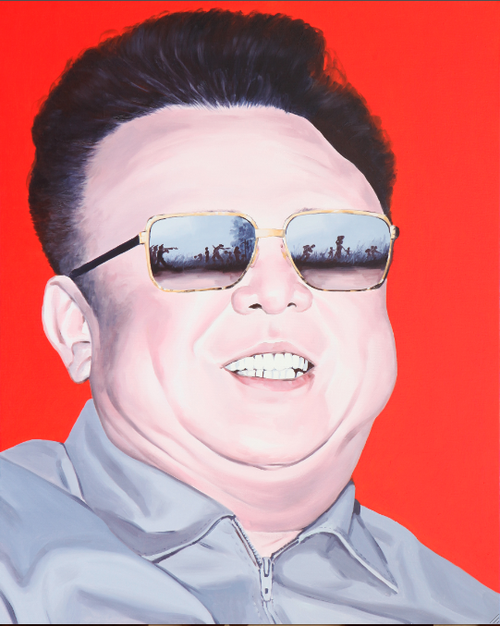 "There is an unusual, unsettling emotional depth in the best of his works which make them more than just comments on North Korea but lift them to existential statements."